-That’s Amore, Dean Martin (1917-1995), Composed by Harry Warren (1893-1981), Lyrics by Jack Brooks (1912-1971), Recorded on August 13, 1953, at Capitol Studios, Hollywood, USA, and released on November 7, 1953. 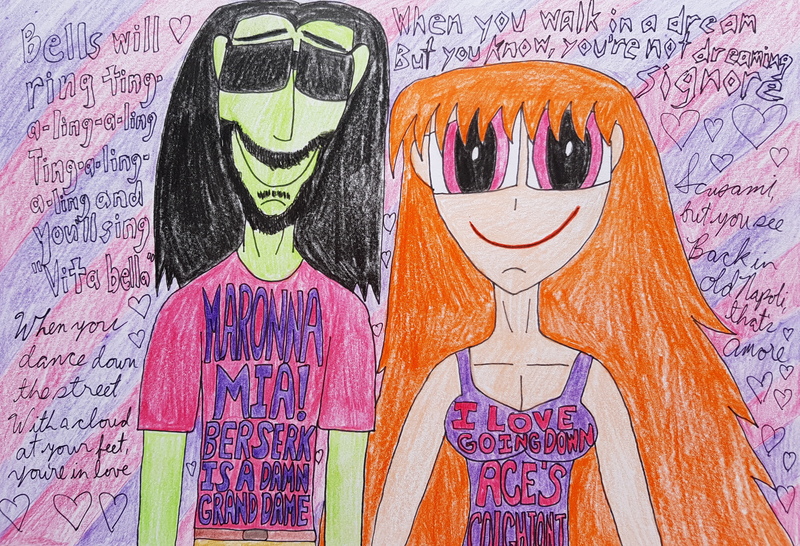 This piece of Aceserk fanart, which is a part of my dear friend’s Kaitlyn’s aka KatyGorl’s Claim a PPG Pairing Month, is dedicated to Patrick aka toongrowner who celebrated his birthday three days ago. So, Patrick, I hope you had a very blessed, awesome, grand, exciting, and happy birthday. I wish you well in everything you do as an artist and may your life be full of prosperity and abundance. Wie wir auf deutsch sagen, ich hoffe du hattest einen sehr gesegneten, tollen, grandiosen, aufgeregten und herzlichen Geburtstag. Ich wünsche dir alles Gute in allem, dass du als Künstler tust, und ich hoffe, dass dein Leben viel Wohlstand und Fülle hat. Alles Liebe, Freude und Schönheit. Come se dice in italiano, tutto il mio amore, felicitá e beltá nel tua vita come artista ed uomo molto talentuoso. Ace x Berserk, in my opinion, is a pairing I think could work. Think about it. Both of them are leaders of their respective gangs and there could be something about them that makes them all the more intriguing as a couple. When one combines Ace of The Gangreen Gang’s suave, devil-may-care nature to Berserk of The Powerpunk Girl’s hot-headed personality, then you have a pairing that can develop from being a love-hate relationship to something that is really exciting. Moreover, I think not a lot of people ship this and let’s not forget that in my Team Xtreme headcanon, Ace and Berserk are married. By the way, I also did a bit of research on Italian-American slang, so in case you didn’t know what the terms “Maronna mia!” and “Colghioni” mean, the respectively mean, “My God!” and “part of the male anatomy”. Here’s the link to slang. Since I am fully aware of Ace’s Italian American heritage, I figure that the Dean Martin classic “That’s Amore” would be a nice fit for this sweet and spicy couple. I invite you all to listen to the two versions of this song that I love, the first one being the original Dean Martin version and the second one being the Russell Watson version. Let me know which one of these versions you love and I hope you enjoy, as you gaze at the cuteness that is Aceserk. I hope you all enjoyed this and I will see you in the next submission. 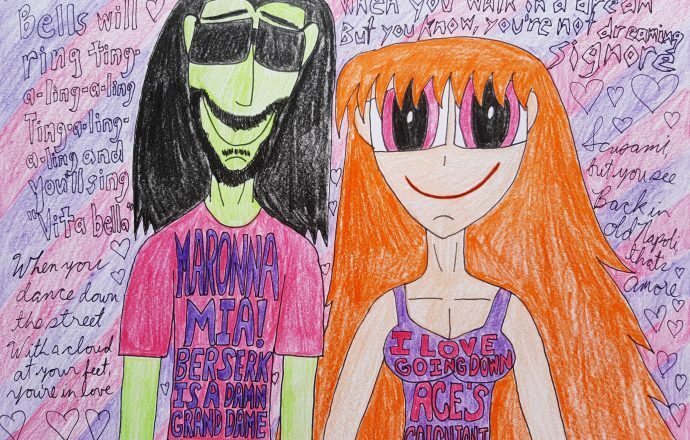 Ace D. Copular and Berserk Plutonium from The Powerpuff Girls belong to Craig McCracken and Cartoon Network.